The developmental foundation of a classical education is the cultivation of wonder and an appreciation for language. The lessons in this level encourage wonder through and early love of language, numbers, and books. All of the books, prayers, and songs included in this level can help you nurture your child's imagination, provide shared moments, initiate satisfying conversations, and strengthen your child's faith. Along with the activities presented here, enjoy nature walks with him, play in water, sand, and mud; relax outside and indoors; and spend plenty of time at playgrounds, in backyards or swimming pools, and with balls and pedal toys to help strengthen his body and give him self-control over his movements. This Curriculum Manual is made to be used in conjunction with Simply Classical Curriculum: Level A.
Prayers for Children is a Little Golden Book Classic. Illustrated by Eloise Wilkin, this little book features simple and beautiful prayers for different occasions in the life of a young child. Begin fostering a devotional heart in your child with these precious little prayers. It's never too early to tell your children about Jesus and what He has done for them. This book teaches young children that Jesus, their Savior, is with them, no matter where they go or what they do. Children identify with the charming illustrations that help them grasp the biblical truths on each page. The tangible and intangible are linked to help children understand that Jesus is a very real presence in their lives. This colorful board book teaches young children about the concept of prayer at all times and in all places with an emphasis on Christ's divinity, His love for us, and His promise of salvation. Charming illustrations appeal to all children and adults. It's never too early to tell children about Jesus and what He has done for them. This brightly colored book introduces Jesus and some of His characteristics as God, the Son. Jesus Knows Me shows the characters in a variety of playful, imaginative settings. Each page states a biblical truth in simple, child-friendly language and illustrates it by showing a scene that young children will identify with. This helps toddlers associate the everyday situations they know with the presence and power of Jesus in their lives and familiarizes them with the idea that he knows and cares about them. Reading through Big Red Barn, you'll learn in the barnyard there are roosters and cows, horses and goats, and a pink piglet who is learning to squeal. Margaret Wise Brown's lulling story about a day in the life of a barnyard is now available as a sturdy board book. Join Mouse in The Best Mouse Cookie while he bakes cookies, takes a nap, burns the cookies, and has to start all over. This little board book is a classic story about baking, sharing, and friendship. Little Fur Family by Margaret Wise Brown tells the story of a little fur child and the day he spends in the woods. In the woods he sees his grandpa, plays with a fish, meets a bug, and then discovers an even tinier fur animal. The little fur child's day ends with supper in his warm home and being tucked into bed by his father and mother. Bunny's Noisy Book by Margaret Wise Brown tells the story of a little bunny who wakes up and hears lots of things. He hears birds, roosters, and bumblebees. Then, he starts to make noise himself as he eats, stretches, scratches, yawns, and sneezes. After his big day, bunny goes back to his hole to cuddle up with his family for a good night's sleep. This little book about bunny's day will teach your children about the noises they hear and even some of the ones they make themselves! From Head to Toe by renowned children's author Eric Carle will have your children wiggling around as they mimic the movements of the animals described in the book. Giraffes, monkeys, penguins, crocodiles, and elephants turn, stomp, bend, clap, and kick and encourage children to do it too! Watch your children build their confidence and gross-motor skills as they interact with the animals in this fun and exciting picture book. Goodnight Moon by Margaret Wise Brown is a classic children's book beloved by generations of readers. In a great green room, there are many things to say goodnight to. As the reader says goodnight to the things in the room (and also the moon!) the poetic verse and colorful pictures impart a sense of the warmth and comfort that can only be found at bed time. This timeless children's book makes for a wonderful way to end the day together! Polar Bear, Polar Bear What Do You Hear? is sure to have your child roaring and snorting as they imitate the noisy wild animals in this book. Lions roar, hippos snort, and peacocks yelp, in this colorfully illustrated little book all about the noises animals make. The very last page gives children the chance to try out these fantastic noises themselves! A beloved classic, Brown Bear, Brown Bear, What Do You See? teaches children their colors through the vibrant illustrations of Eric Carle. Children learn to identify red birds, white dogs, gold fish, and many more colorful animals as they read all about what they can see. Numbers Colors Shapes is an ideal book for little readers with its padded covers, colorful pictures, and simple, everyday words. This little book introduces children to essentials like numbers, feelings, sizes, shapes, times of day, and colors. A story about persistence and hard work, The Very Busy Spider hardcover book is a colorfully illustrated story with sensory printing for your young reader to see and feel the spider web that the spider is making. In Goodnight, Gorilla, all the animals in the zoo are headed to bed. Well, almost everyone. Someone short and furry seems to have taken the keys to the animal cages, and he looks like he's up to something mischievous! Follow the zookeeper, and see what goes on behind his back in this jovial bed-time tale. The Tale of Peter Rabbit is a retelling of the classic story of mischievous Peter and his adventure in Mr. McGregor's garden. The short sentences and simple language make it perfect for young readers. The whimsical, full-color illustrations will immerse children in the beauty and simplicity of an English garden as they learn to know and love this classic tale of Peter Rabbit. Fuzzy Yellow Ducklings is a wonderful introduction to shapes, colors, and animals for young readers. The special peek-a-boo pages hide fun surprises, and children are sure to be thrilled as the textured shapes transform into colorful creatures. This book helps sharpen young children's sensory awareness as they touch furry koalas, wooly sheep, scratchy sharks, and sticky frog tongues. The My Very First Book of Shapes is a split-page, colorful board book that allows your child to see the shape and identify those shapes in real objects. From Aunt Annie's Alligator to Zizzer-Zazzer-Zuzz, this sturdy board book version of Dr. Seuss's ABC: An Amazing Alphabet Book! is now available in a bigger trim size. With Dr. Seuss as your guide, learning the alphabet is as fun and as funny as the feather on a Fiffer-feffer-feff! Put Me in the Zoo by Robert Lopshire, the colorful creature, Spot, wants to be in the zoo with all the other animals. He begins showing a young boy and girl how very special he is by changing the colors of his spots. In the end, Spot's new friends help him find the perfect place for him! Lopshire's sweet and silly story with short words and colorful illustrations teaches children that there truly is a spot for everyone. Hand, Hand, Fingers, Thumb is a brightly illustrated board book written by Al Perkins that teaches young children about their hands with fun illustrations of musical monkeys. Cars and Trucks from A to Z is a classic alphabet book from Richard Scarry. With full color illustrations of creative cars, this apple-mobile board book teaches young readers every letter of the alphabet from an ambulance to a zippermobile! My First Counting Book is a classic Little Golden Book and a must for every preschooler's library. Using simply rhymes and illustrations of baby animals, this book encourages young readers to begin learning their numbers. The Animals' Christmas Eve is a sweet story told in rhyme in which a group of animals recounts the events surrounding Jesus' birth in the manger, and the parts some of their ancestors played in it. This book also helps your student as they begin learning counting. Big Dog...Little Dog by P.D. Eastman tells the story of the two best friends, Fred (Big Dog) and Ted (Little Dog). Fred plays the flute and Ted plays the tuba. Ted loves red and Fred likes green. Fred skates and Ted prefers to ski. The dogs don't seem to agree on anything! Despite their many differences, these furry friends show that even opposites can be best friends. Dr. Seuss’s Mr. Brown Can Moo! Can You? book of wonderful noises is now a BIG Bright & Early Board Book! Mr. Brown can make oh-so-many noises! Little readers will learn about the sounds they hear everyday and even make some themselves as they follow the imaginative (and noisy!) Mr. Brown. Dr. Seuss’s classic rhymes introduce children to all sorts of new words and encourage them to MOO along! This colorful board book features nursery rhymes from the Real Mother Goose, including timeless classics as "Baa Baa Black Sheep," "Jack and Jill," and "One, Two, Buckle My Shoe." The short verses and colorful illustrations make My First Real Mother Goose a perfect introduction to nursery rhymes for young readers. The classic book with Tasha Tudor's verse and Caldecott Honor illustrations, 1 Is One is a charming introduction to numbers. Simple verses and nostalgic pictures of animals, children, trees, and flowers teach children their numbers from one through twenty. Level A provides an introduction to wonder, books, and language. Intended for children ages 2-3 or special-needs children at an introductory level, this program offers daily lessons designed to teach beginning readiness abilities in the rich context of beauty, stories, and prayer. Level A emphasizes oral language through such enjoyable readiness concepts as animals sounds, counting books, and nursery rhymes. 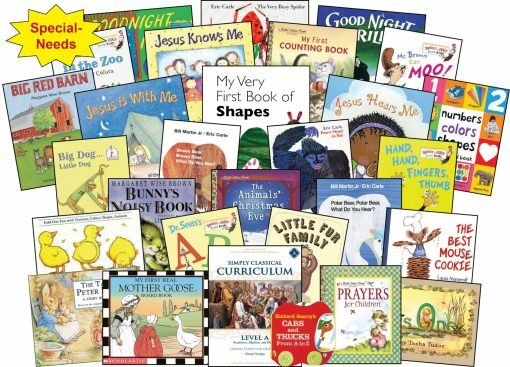 We teach prayer through the beautiful book Prayers for Children, a collection of prayers memorized by children for generations. Prayer time can help a child practice simple reverence, devotion, and thankfulness. We bring order to the child’s mind with a gentle routine. Level A introduces the observation of time and patterns such as morning, afternoon, and evening. In Level A, the child hears the same verse from Holy Scriptures: “Give thanks unto the Lord, for He is good.” Over time, he may recite all or part of this verse and other repeated elements. Imitation and recitation, even at such early levels, assist memory, concentration, and confidence. Enjoy a joyful sense of coziness by reading Level A books together. Children’s authors such as Margaret Wise Brown and Joni Walker introduce a love of words through delightful stories. 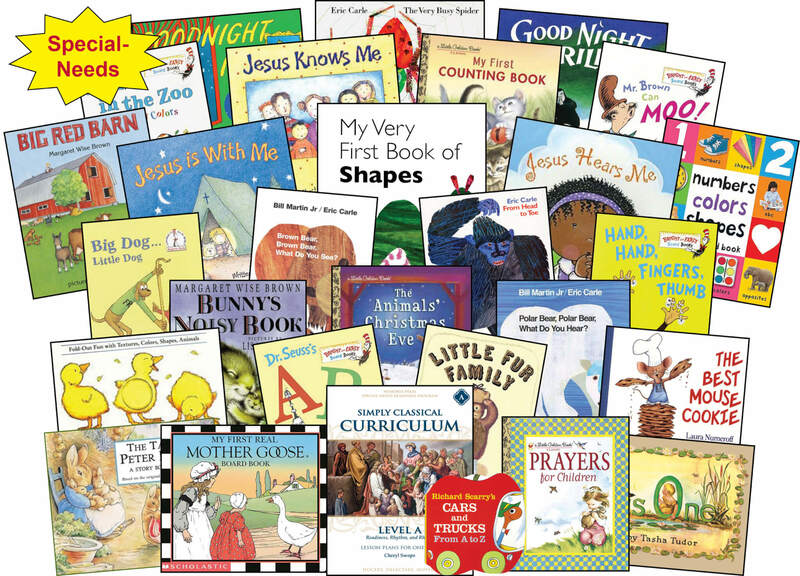 In Level A many of our selections are board books for ease of handling. If your special-needs child is older and prefers paperback, feel free to substitute paperback versions from your own library or home collection. Language assists all learning. In Level A we introduce vocabulary, opposites, categories, social language, and speaking in complete sentences. Even the nonverbal child will benefit from listening to the lessons and participating as much as he is able. With sensitivity to the nonverbal child, we sometimes offer options such as, “Point to the butterfly.” Substitute your own suggestions for pointing or providing oral approximations wherever needed. From the Ancient Greeks onward, education has helped children strengthen body, mind, and character. In Level A we include fine-motor (small muscle) and gross-motor (large muscle) activities to engage the child in purposeful, language-oriented movement. Such games can be played throughout the day and wih other children. For the special-needs child who receives occupational, physical, speech and language, or other therapies, we include space in the lesson plans to record your own child’s therapy exercises. For those who do not have such therapeutic assistance, we offer suggested enrichment ideas to help with concept development, coordination, balance, and self-control.